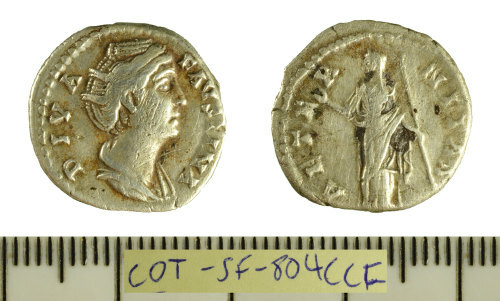 A silver denarius struck for the deified Faustina I (AD 138-141) under Antoninus Pius, dating to c. AD 141-161. Reece period 7. Reverse: AETERNITAS, Juno standing left holding sceptre and raising right hand. Mint of Rome. As RIC vol. III, p. 69, no. 344.